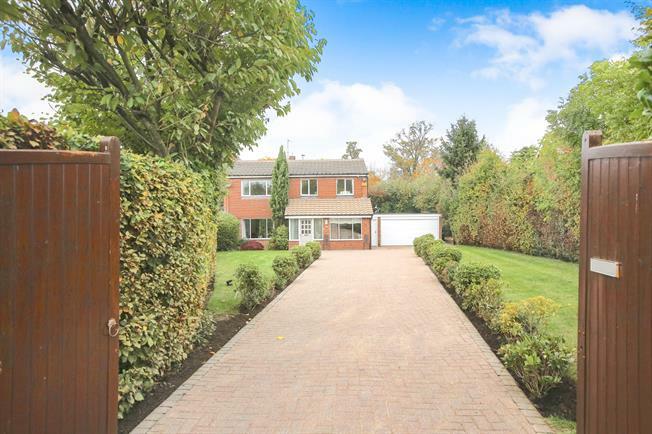 4 Bedroom Detached House For Sale in Alderley Edge for Offers in the region of £825,000. Tucked away behind double gates and set at the end of a long driveway this four double bedroom family home offers well presented, ready to move into accommodation, ideal for family living that also offers a great deal of extension potential having previously had planning permission in place (Cheshire East Planning Reference 07/0689P). The existing accommodation is bright and airy and briefly comprises; entrance hall, substantial living room with duel aspect, family room, dining room, modern fitted kitchen, utility room and downstairs cloakroom / wc to the ground floor. In addition there is internal access to the double garage. The first floor boast four double bedrooms and a modern family bathroom. Externally there is a high degree of privacy to the front and rear. To the front is a long driveway, generous lawned gardens and mature hedge borders. To the rear is an enclosed lawned garden with childrens play area and entertaining and dining terraces. This property represents a rare opportunity to create a dream home and early viewing is essential.